Jim McKinstry, who passed away recently, was a well-known and highly respected member of the Larne community. He was a keen sportsman and was a former captain and subsequently manager of Larne Football Club. Jim McKinstry with the Schools Cup 1947. During a distinguished soccer career Jim also played for Cliftonville, Distillery and Glenavon. The McKinstry family connection with Larne continued with his son John also playing for the team over two decades. Jim earned two schoolboy caps in the late 1940s and was capped twice for Northern Ireland’s Amateur side between 1957 and 1959. A gentle giant, Jim was a towering defender for Cliftonville, Distillery and Glenavon, before coming to Inver Park in Larne. In 1975 he took temporary charge of the team off the pitch, acting alongside secretary Billy Simms, and he also served at one time as vice-chairman of the club. Glenavon Football Club also remembered him as “a commanding defender” who had made 119 appearances for the team. He was signed to the club in 1959 from Distillery by the late Jimmy McAlinden and went on to make an outstanding contribution to the team, crowned league champions in 1960. They went on to win the Irish Cup the following year, and Jim McKinstry enjoyed four seasons at Mourneview Park. At Larne, Jim McKinstry successfully captained the team to victory in the Steel and Sons Cup final in 1964 and as manager of the side saw them through three other Steel and Sons Cup finals, the last being the defeat of Glentoran Seconds in the 1968 final. Aside from sport, Jim was well-known as owner of a greengrocer’s shop, which bore the family name at Dunluce Street in the town. The McKinstry family also owned a greengrocer’s shop in Ballyclare. Jim was the son of Jack and Annie McKinstry and grew up with four siblings, his brother David, who predeceased him a few years ago, and his sisters Celine, Stephanie and Dymphna. 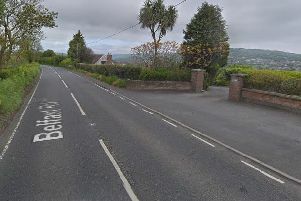 The family lived at Kent Avenue in Larne and Jim attended the McKenna Memorial Public Elementary School at Agnew Street, just a short walk from the family home, then went on to St. Malachy’s College. An early indication of his soccer talent came while attending McKenna Memorial, when he was on the school team which son the Irish Schools Football Association Challenge Cup in 1947. He was pictured with his winning team and is holding the cup in the photograph on this page; it is believed he was the last survivor of that proud team of yesteryear. Jim McKinstry’s business connections in later life led to involvement in the Rotary Club in Larne, while he was also an accomplished golfer and a familiar figure at Cairndhu Golf Club. Formerly of Branch Road on the outskirts of Larne, Mr McKinstry passed away peacefully at Gillaroo Lodge Private Nursing Home, on January 27, having been predeceased by his wife Eileen in December 2014 and by his daughter Lisa. His funeral mass was held at St Anthony’s Church at Craigyhill, following which interment took place at the adjacent Larne Cemetery. Donations in lieu of flowers were encouraged to the Alzheimer’s Society, c/o E.W. Ramsey &Son 5 Upper Main Street, Larne. Mr McKinstry is survived by his sons John, Gary, and Peter, daughters-in-law Nicola and Amanda and grandchildren Ryan, Neil, Marc, Cara, Jodie and Dillon. The respect in which he was held has been reflected in the number of tributes on social media, a high percentage using the term “gentleman” to describe him.